Deep Blue Star (Sapphire Star), 2017. Retail Price $ 240 US dollars. 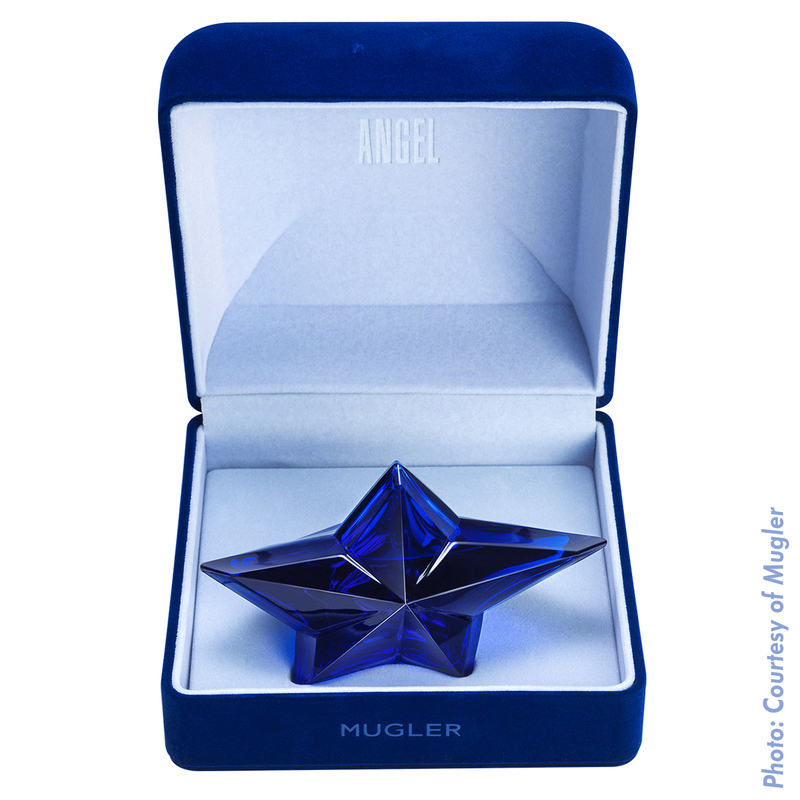 For 2009 Mugler perfumes continues the Deluxe supersize bottles with the luxurious Angel Collector Superstar. 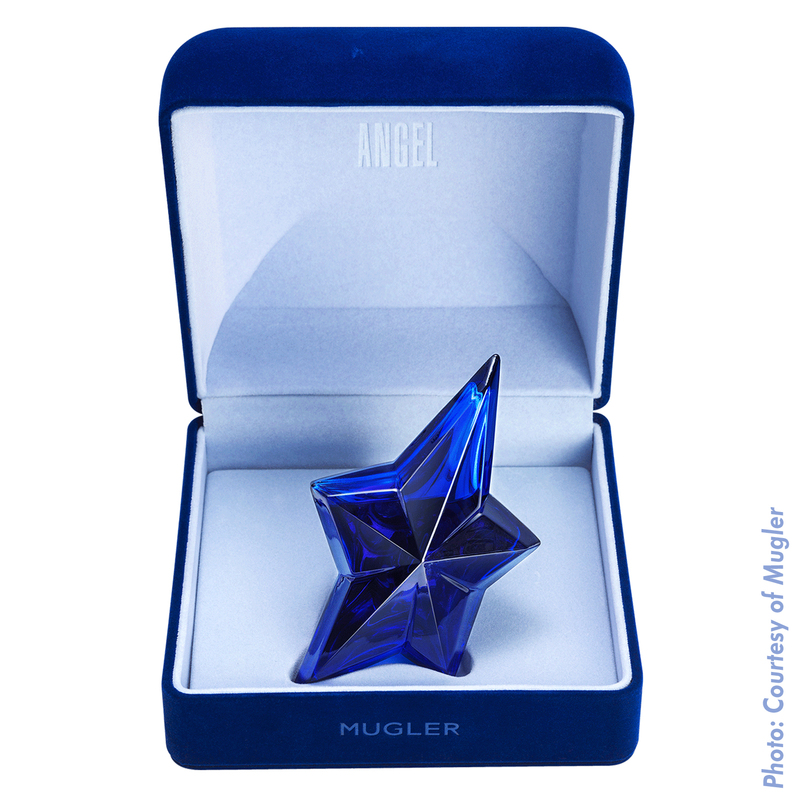 This bottle is part of the Angel Palace Collection that is characterized by the inclusion of a large 38mm Oval Swarovski crystal pendant that can be used as a necklace. Shooting Star Edition with large Swarovski crystal pendant. Collector Superstar, in the large jumbo sized bottle. This large bottle also features around 250 gleaming round Swarovski crystals, I believe, are glued to the bottle’s surface and not incrusted in the crystal. Kind of like a Judith Leiber handbag. If anyone has this bottle, can you confirm if the crystals can fall off easily. 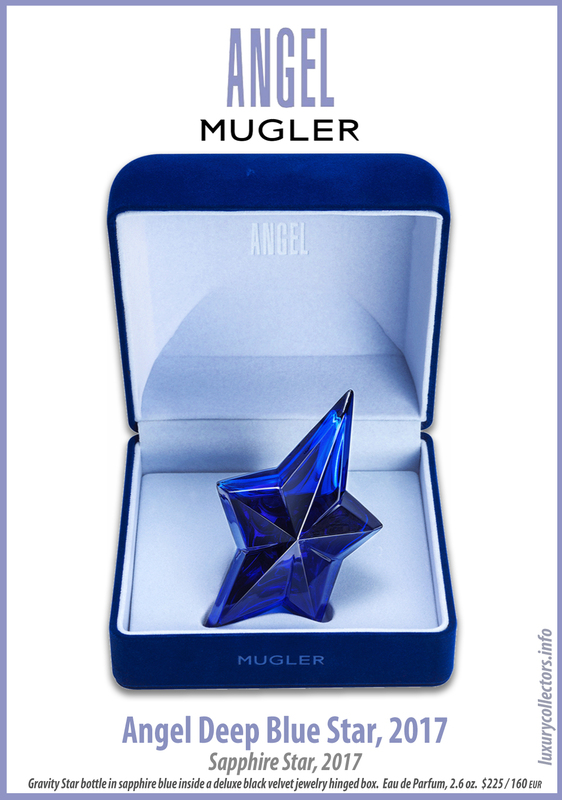 As with the other Superstar bottles, (2007 Dream of Superstar) this bottle is large, like a Factice display bottle, containing 14.2 fl oz (420ml) of ultimate Angel perfume. 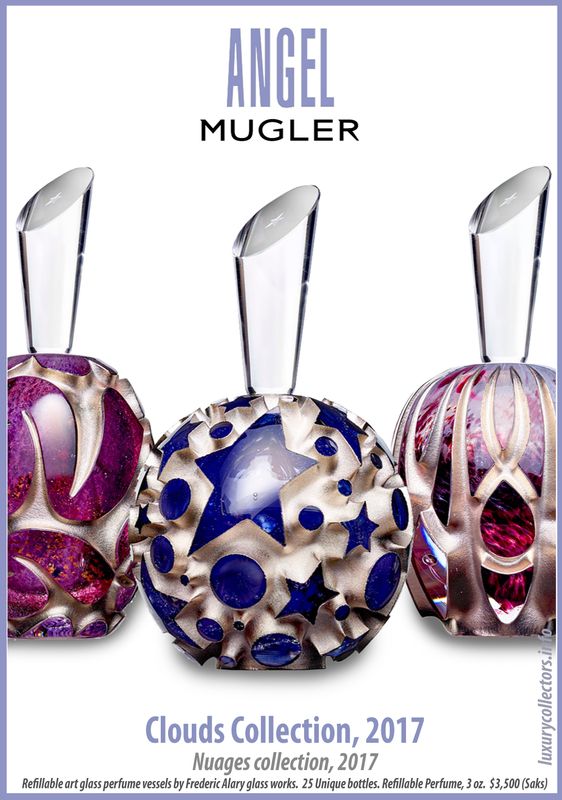 The edition of these bottles is very rare, with less than 100 pieces available in the Angel Universe. 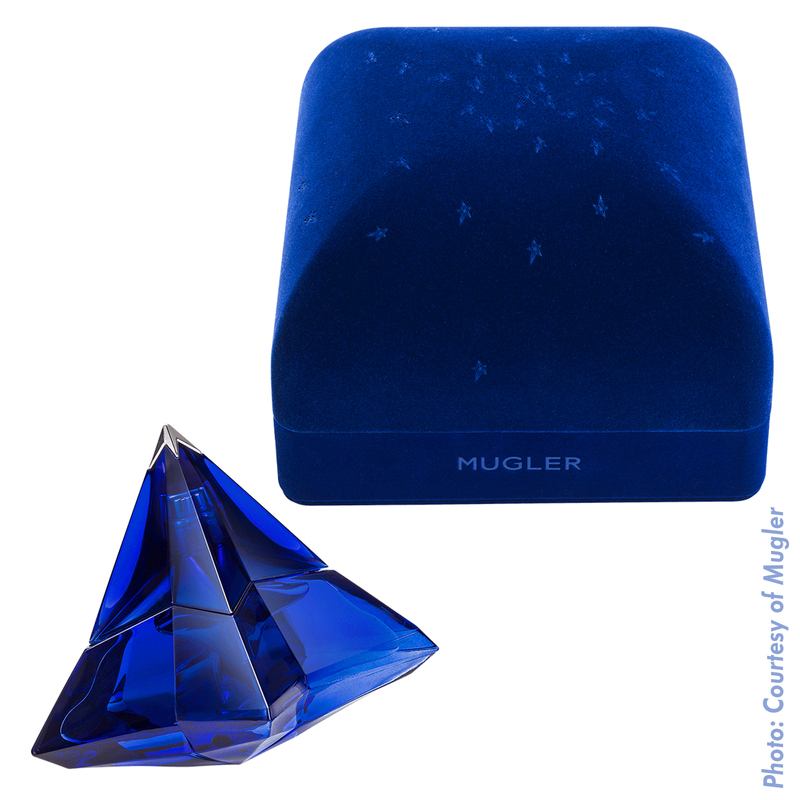 The inclusion of the Swarovski crystals, the small number produced and the large size gives this bottle a retail price of $3,000 US dollars, the highest ever for an Angel Perfume edition. Unfortunately I do not own this bottle, so I do not have detailed photos of its certificate, presentation box, but I have a snapshot of Saks website with lots of information about it when it was available for purchase. 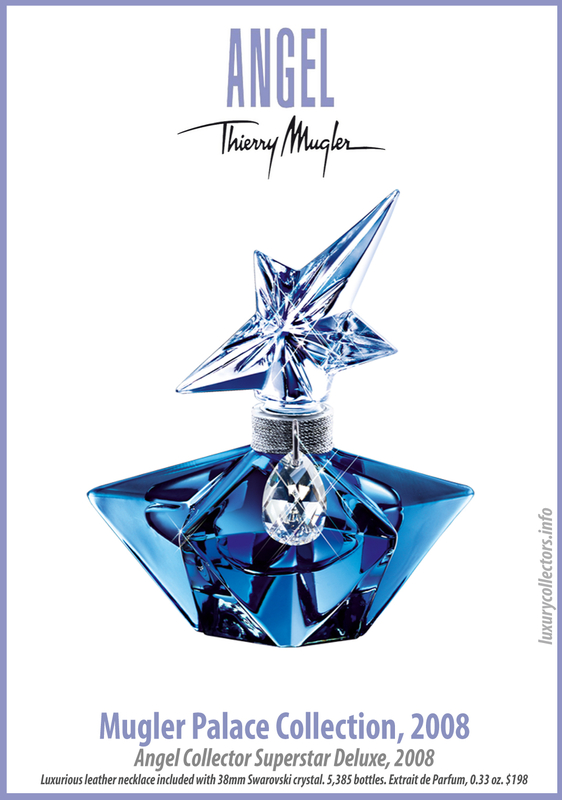 Photos of Thierry Mugler’s Collector Superstar Perfume Bottle. Large Swarovski pendant hangs from a chain in the center of the bottle, surrounded by 250 Swarovski crystals.